Dr. Tracy Ochester specializes in the delivery of Cognitive Behavioral Therapy (CBT) to high school age teens and adults whose concerns are appropriate for this type of treatment. CBT is a research supported treatment that has shown to be effective in managing a number of mental health conditions including depression and anxiety. 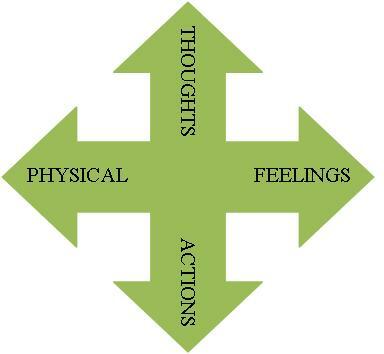 This approach focuses on the interaction between thoughts, feelings, physiology and behavior. Clients are taught to identify problematic cognition (thoughts), body sensations and actions and to modify them so that they can feel and function better. This treatment approach can be empowering because it helps clients understand what is within their control and how they can take action toward positive change. The therapist helps the client set goals that they work on together in a systematic fashion. It is an active form of therapy, so clients who are willing to do “homework” outside of sessions tend to make more rapid and significant progress. If you are interested in CBT for depression or anxiety, please schedule an initial assessment using our secure, HIPAA compliant online scheduling system to discuss your concerns with Dr. Ochester and see how she might help. Hofman, S. G., et. al. (2012). The Efficacy of Cognitive Behavioral Therapy: A Review of Meta-analyses. Cognitive Therapy and Research; Volume 36, Issue 5, pp 427-440. SAMHSA’s Systematic Review of Studies on the Efficacy of Cognitive Behavioral Therapy for Depression and Anxiety Disorders (2012). Tolin, D.F. (2010). Is cognitive-behavioral therapy more effective than other therapies? A meta-analytic review. Clinical Psychology Review, Aug;30(6):710-20.